Following a thank you email sent on a whim by her mom to the company behind Lottie dolls, six-year-old Abigail was given an extraordinary opportunity by its co-founder Lucie Follet. The stargazing, space-loving girl, who counts retired Astronaut Chris Hadfield, the first Canadian to walk in space, as her personal hero, was invited to design a special edition Lottie doll inspired by her own interests. 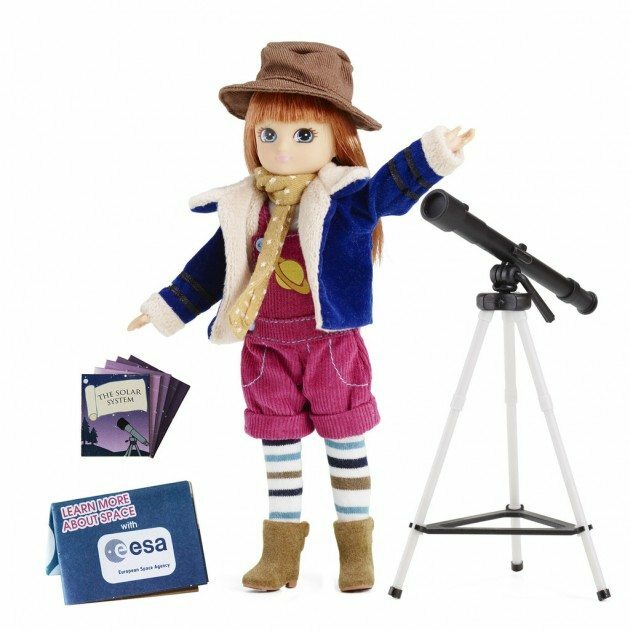 And, in a second life-changing moment that puts Abigail one step closer to her dream of traveling to space one day, her ‘Stargazer’ made history this week by becoming the first doll in space after arriving at the International Space Station with British European Space Agency Astronaut Tim Peake. Developed after 18 months of comprehensive research, the body of all Lottie dolls is “based on the scientific proportions of a 9-year-old child, with the exception of her head (which has been increased to accommodate hair play)”. None of the dolls wear jewelry, makeup or high heels, and they can stand on their own two feet… literally and figuratively. The clothes the dolls wear – from hard-wearing to dresses – are “activity based,” and in line with a typical 9-year-old’s wardrobe.